The Great 8 animated projects alongside international consultant, Heather Kenyon (fourth from left). 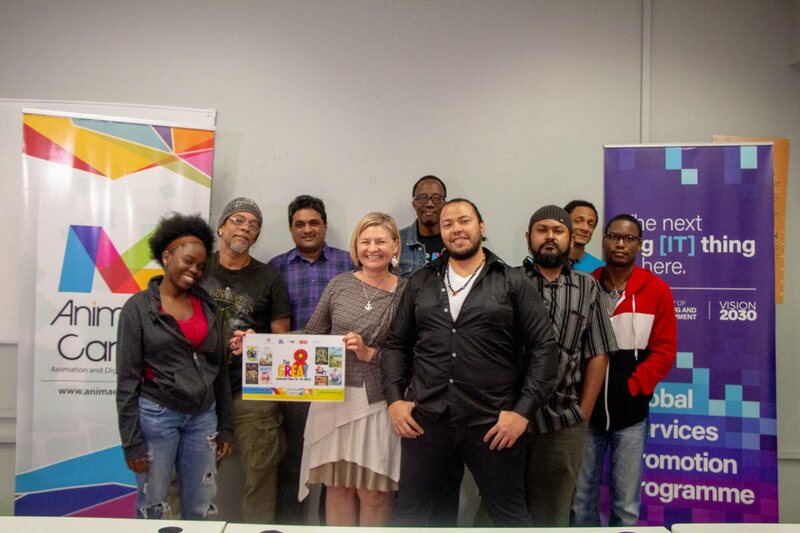 INNOVATORS can bring to life local or Caribbean characters to rival Spider-Man, the X-men and the Incredible Hulk in years to come, says Trade and Industry Minister Paula Gopee-Scoon. She said for young creatives animation is an untapped career option rife with opportunities. 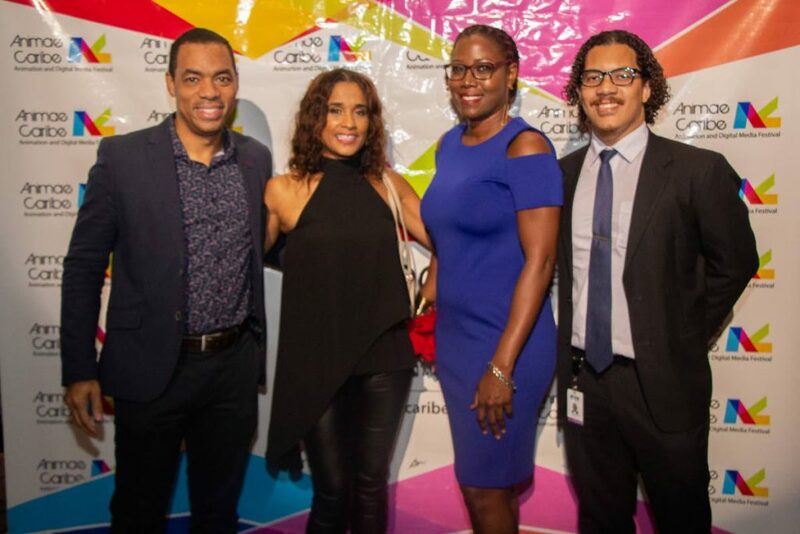 Animae Caribe Festival Founder and Creative Director Camille Selvon Abrahams (second from left) greets lead festival sponsors at the opening night of the festival held on Monday at the National Academy for the Performing Arts, Port of Spain. From left are First Citizens Deputy CEO Business Generation Jason Julien, FilmTT General Manager Nneka Luke and Inter-American Development Bank representative Kamau Joseph. Gopee-Scoon said the Government, guided by Vision 2030, is committed to developing the film industry and helping it become a globally competitive business. She added through training facilitated at the University of Trinidad and Tobago in digital media and animation; knowledge, skills and entrepreneurial capabilities are being developed. She said the Government sees a strong future for the industry, including animation and digital media as generators of employment, revenue and export earnings; using skills to compete meaningfully in the fourth industrial revolution. Gopee-Scoon described as noteworthy that three animation firms out of six companies were awarded grants under the Ministry of Planning and Development’s Skills for Global Services which is part of the Global Services Promotion Programme in partnership with the Inter-American Development Bank. 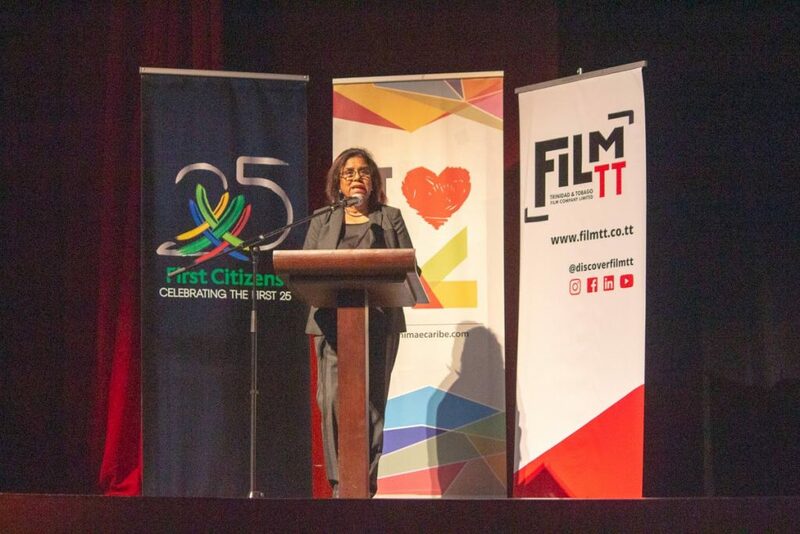 Trade and Industry Minister Paula Gopee-Scoon delivers an address at the opening night of Animae Caribe 2018 on Monday at the National Academy for the Performing Arts, Port of Spain. She said Animae Caribe continues to facilitate partnerships and more importantly promote TT as an animation hub. The festival ran from November 19 to November 24. It began with a public screening of Isle of Dogs, a 2018 stop-motion-animated science-fiction comedy-drama film written, produced and directed by Wes Anderson. The film’s production designer Paul Harrod was the “Super Guest” for the festival and conducted two days of master classes during the festival. Reply to "Animae Caribe 2018 inspires youth"